Quick: Which group consistently tops the list of U.S. political donors  bankers? Oil barons? The Koch brothers? Nope. Try schoolteachers. The two major teachers' unions, despite all the rhetoric about how teachers have no influence on policy, collectively spent more than $67 million directly on political races from 1989 to 2010. And that figure doesn't include millions more spent by their state and local affiliates and all kinds of support for favored (read: reform-averse) candidates. For years, union leaders have lambasted as antiteacher pretty much every proposal to expand charter schools, improve teacher evaluation and turn around low-performing schools. Yet these reform issues have moved to the mainstream as even the Democrats, traditionally labor's biggest allies, have gotten fed up with union intransigence to structural changes to improve America's schools. Meanwhile, states as diverse as Massachusetts, New Jersey, Florida, Ohio and  you guessed it  Wisconsin are attacking union prerogatives such as valuing seniority over on-the-job performance and collectively bargaining for benefits. At the same time, black and Latino parents are growing increasingly impatient with lousy schools and are organizing in an effort to provide a counterweight to the unions. Just last week, the nation's second biggest teachers' union, the American Federation of Teachers, was embarrassed when a PowerPoint presentation surfaced on the Web outlining strategies for undercutting parent groups. Sample quote: "What helped us? Absence of charter school and parent groups from the table." The takeover artists. The Los Angeles teachers' union, United Teachers of Los Angeles (UTLA), has long been regarded as one of the nation's most hidebound. But Jordan Henry, a 12-year veteran teacher, wants to change that, so last year he co-founded NewTLA. (Get it? Rhymes with UTLA? C'mon, this is education reform  we must find little bright spots wherever we can.) Henry has managed in short order to build a large dissident faction within the union. After the last union election, NewTLA holds 90 of the 350 seats in the union's house of representatives, an impressive feat of organizing given how challenging it is for nonmainstream candidates to get much traction within the union. And although Henry is trying to change the union from within, he is not shy about criticizing it publicly, recently telling the Teach For America alumni magazine that, "I don't think my local affiliate is a leader in reform, as much as it says it might be." NewTLA is already taking on tough issues like seniority and urging UTLA to move from its narrow focus on the teachers' contract to a broader one about how to improve schools. The outsiders. Educators for Excellence (E4E) is a group of more than 3,500 New York City teachers that is to trying to change laws and policies by going straight to policymakers. For instance, when New York Mayor Michael Bloomberg proposed doing away with the current system of laying off the most recent hires first, the union attacked any notion of letting principals unilaterally pick which teachers get booted. But the newly formed E4E forced its way into the conversation and sought a middle ground, proposing an alternative that took into account such things as how often teachers had been absent, whether they were actually in front of students or in nonteaching "reserve" roles and also factoring in performance ratings. The union wasn't enthusiastic about this approach either, but the idea got traction in Albany. And although the city and the teachers' union cut a deal on layoffs, the episode established E4E as a voice in education policymaking. E4E's leaders say they don't want to create a parallel organization to the unions; their goal is to "generate an elevated profession of teachers who want to be accountable," according to Sydney Morris, one of two New York City teachers who founded the group last year. Still, given the divergence between its positions and ethos and those of the teachers' unions, E4E seems destined to be an outside agitator for a while. Look for it to expand to other cities to "demonstrate that there are teachers across the country who feel this way," says co-founder Evan Stone. "It's not isolated bubbles." The hybrid. Teach Plus is a network of teachers with chapters in Boston, Chicago, Indianapolis, Los Angeles, Memphis and, starting this fall, Washington. The group recruits accomplished teachers who want to take on leadership roles within their schools or to advocate for public policy changes without leaving their classrooms. More than 4,500 teachers are involved so far, and about 250 have gone through selective 12- and 18-month fellowships. Teach Plus says it wants to partner with unions  albeit by bringing reformers inside the tent. Celine Coggins, a former middle-school science teacher in Massachusetts who founded the group in 2007, says many teachers often tell her that the unions "seem like my grandfather's union, not necessarily mine." That's why Teach Plus is offering a home for teachers interested in an organization, as Coggins puts it, "with a bias toward high performers"  eduspeak for wanting to support and reward the best rather than focus on defending the worst. Teach Plus is starting to make a dent: its members are now serving in leadership roles within the Boston Teachers Union. It's too early to tell whether any of these groups  or even all of them working in tandem  will succeed in changing the teachers' unions. Will the uprisings bring about a transformative revolution like in Tahrir Square or a deadlock like in Libya? And while ridiculous seniority policies provide easy targets, more complicated issues such as teacher evaluation and creating a genuinely professional culture within schools lie ahead for them. Union leaders, meanwhile, bristle at the upstarts and so far seem less inclined to help them than to co-opt or marginalize them. And there is an obvious structural hurdle facing the insurgents: like all unions, teachers' unions exist to protect their members, creating a natural conflict between, say, maintaining job security for everyone and implementing measures that differentiate based on performance or create real accountability for results. But when you talk to progressive union leaders and the teachers at the vanguard of this new movement, it's striking how much they have in common  even accounting for disagreements around specific policies. Most notably, they share a frustration with the education conversation today and a desire for actual change. 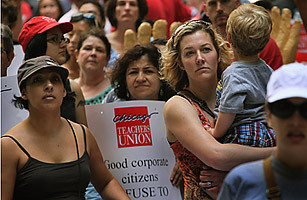 Over the past two decades, the demand for reform has caused the teachers' unions to do little more than budge on a few issues. AFT President Randi Weingarten admitted to CBS News earlier this year that in some places teacher tenure does amount to a job for life, and her union has put forward its own teacher-evaluation proposals. Still, it's not yet the kind of dramatic change needed to create genuinely high-performing schools. So although significant reforms in education have traditionally come from outside the education field, perhaps with these budding alternaunions, the best hope for change is now coming from within. See the 20 best- and worst-paid college majors.